Pressure cooking is a healthy alternative for people who like to cook with little or no oil and if cooked correctly for the right length of time, this method can not only save you cooking time and fuel but in doing so, also retains the natural flavour and nutrients of your food. Once you have mastered the fundamentals of using your pressure cooker, it will open a whole world of cooking up to you whether you are a vegetarian, vegan or meat eater. You can easily adapt conventional stovetop or oven recipes so that you can cook them the quicker healthier way although you may need to research cooking times as cooking in a pressure cooker can dramatically vary cooking times. Un-soaked brown French lentils which take 40 minutes to cook on a stovetop can cook in a pressure cooker in 6 to 10 minutes. 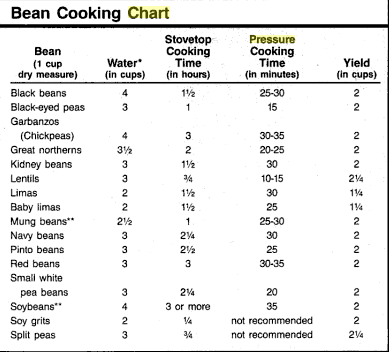 This demonstrates just how much time can be saved when using a pressure cooker although when you refer to pressure cooking time charts, you need to bear in mind that the times shown do not include preparation time etc. and are rather an indicator of the time that the food is cooked under pressure. It also does not include the time that the cooker takes to build the pressure which can be anything from 5 to 40 minutes after the lid has been sealed securely into place. 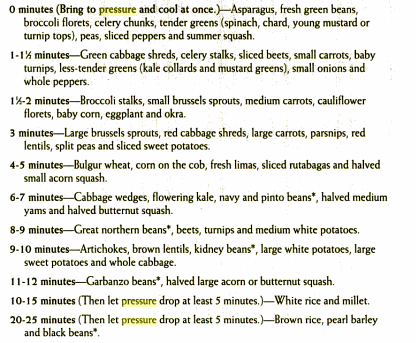 The amount of time this pressure-building process takes all depends on how well your pressure cooker conducts heat, the size of the cooker, the heat setting, the amount of food and liquid placed inside and the temperature of the food as frozen or cold ingredients will lower the liquid temperature which will take longer to reach boiling point and create pressure. If you are pressure cooking meat, you will need to add more liquid to the cooker and as most cuts of meat cook in 45 minutes or less, you will need to add at least 1 cup of water or stock although if you are cooking for an extended period, you will require at least 1½ cups of liquid. As a guide, a whole chicken which weighs up to 4 pounds should cook in 25 minutes and up to 3 pounds of breast with the bone in should cook in 10 minutes using the quick pressure release method. However, these times are estimated and if you are in doubt, use a meat thermometer to check the meat’s internal temperature to ensure that it is cooked through. 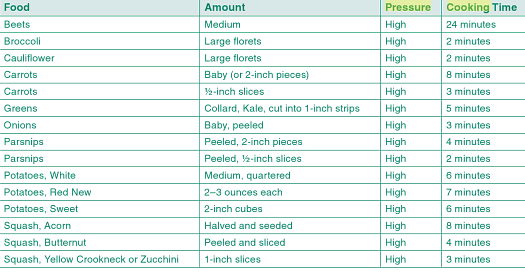 This demonstrates not only that it does not take long to cook vegetables in a pressure cooker but also that smaller, uniform pieces cook quicker that bigger piecess. The pressure in the cooker can be controlled by adjusting the heat on the stove burner. This can be changed among 5, 10 and 15 pounds at temperatures of 220, 235 and 250 F. This difference in pressures is indicated in the recipes and the cookers have different means to check the pressure. Low Pressure is usually used to cook delicate and tender vegetables or fish. Medium pressure is used to make steamed puddings. High pressure is commonly used in all the recipes and is used for cooking vegetables, rice, beans, pasta, meats, dried vegetables, fruits and mushrooms.